A jelly roll pan is very similar to a cookie sheet or a baking sheet apart from the sides of the tray are only around 1 inch deep. These are multi-purpose pans that can be used for a host of jobs from roasting vegetables to baking cookies as well as cakes and of course, the cake part of jelly rolls. Just in case you have never heard of one, a jelly roll is a thin sponge cake that is filled with jelly or jam. It is rolled into a round and when sliced, the circular pattern of the filling shows in each slice. Whipped cream and fruit or a fruit preserve is often served on top of the slice of cake while the batter of the cake itself is usually flavoured with vanilla or almond. Strawberry or raspberry jams are the most popular filling along with the same flavours of jelly. However, a chocolate version is also easy to make using the same technique and filling it with whipped cream. Because the outside layer of the cake will be on show on the finished dessert, jelly roll pans are often lined with either wax paper or a silicon mat that can be peeled away from the cake after baking. This gives the top of the cake a smooth finish. It can be easiest to remove this layer once the cake is cooled so the best way to do this is to turn it onto a piece of kitchen towel or another surface with icing sugar on it to avoid it sticking. The jelly roll pan itself is usually made from aluminised steel due to its resistance to rust and even heat distribution. There are also non-stick versions available that may not need the silicon or wax paper layer. The pan is also ideal for a range of other small cooking jobs due to the small lip around the edge. This means food that would otherwise slip off a flat tray, such as a cookie sheet, will be kept in place on the jelly roll pan. There is also less chance of any juices from the cooking process tipping over the edge of the pan and making a mess of the cooker because of the lip. Some cooks will also use the pans to bake cookies, granola bars and some types of cakes for a similar reason – less chance of any spilling off the edge of the pan. This is a commercial grade jelly roll pan that measured 14 ¾ inch by 9 ¾ inch by 1 inch and has an uncoated baking surface. It is made from heavy weight aluminized steel meaning that it bakes the contents evenly, while being strong and durable. It can be washed in the dishwasher, though for best results the manufacturer recommends hand washing. 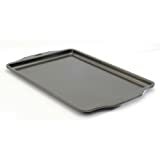 This type of pan would be best to use wax paper or silicon sheets with to ensure the cake doesn’t stick to the pan.